A new restaurant opened recently in Crossgates Mall. Located at the entrance to the mall closest to the movie theater, J&A Prep Kitchen opened in early September, filling a physical void at the former location of Houlihans. So far, you have seen two ways to represent the name of the prep kitchen, “j | a” and “J&A”. Via the image on the company’s facebook page, I’ll introduce a third, “J / A”. I am going to split hairs; these three are not equivalent mathematical or logical expressions. Focusing on the logical aspect, J&A would mean “J and A”. This, I believe, is the intended usage, as it is named after Jacob & Anthony, the same people represented in the name of a Saratoga eatery. J / A would mean “J or A,” which doesn’t make any sense at all. Back to the first usage, “j | a”, the usage on the logo (also on the facebook page) can be logically perceived to be the same as “J / A” but took on a completely different meaning for me. It looks like lowercase JLA, and, since I’m a comic book fan and a person who will continue to use the improper usage whenever possible, my company, consisting of Cassie, my brother and girlfriend, and a friend with her husband and children, had to put up with me calling it “JLA Prep Kitchen” for the rest of the meal. Yes I did just type all that, and you probably read it. 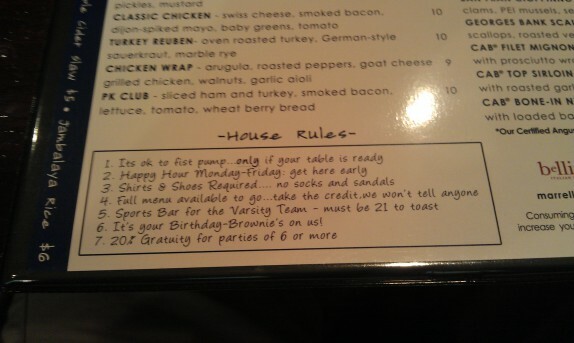 Upon first scanning the menu, I found the house rules. I don’t know if I think it’s amazing or if it’s horrible that the place encourages fist pumping. You know what? Even though I would never seriously fist pump, I think it’s awesome. I ordered a burger. There are a handful of burger options on the menu as well as some sandwiches and interesting sounding plates. I went with the chipotle cheeseburger – pepper jack, chipotle mayonaise, onion straws, and green chile salsa. 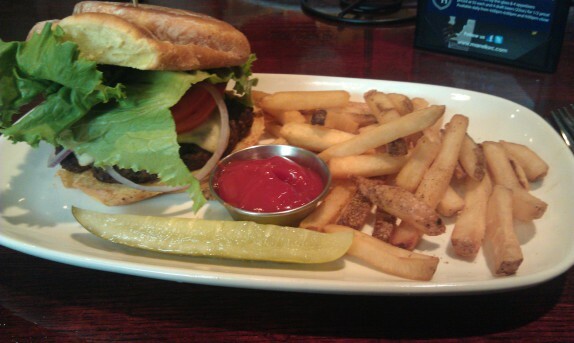 I only had the opportunity to take one picture before I devoured the burger. There are a few things you can take from the image. They give an average to below average amount of fries for a burger priced at $10 in the Capital Region of NY. The burger did not come as described. I believe it’s not nitpicking at all to point out that I got raw onion when it was advertised that onion straws would be on the burger. I also didn’t get any green chile salsa on the burger. I am not completely convinced I got the right order, and the lettuce and tomato on it kind of adds to this. Because we were a large group and because the waitress was more than accomodating to our group, I just ate it without bothering her. It was a decent burger. I’m going to say it was average. I think it would have been better as advertised. If not better, it would have at least been a little more interesting. Cassie had a rough time. She ordered a chicken wrap, advertised to have arugula, goat cheese, grilled chicken, walnuts, and garlic aioli (doesn’t that sound amazing!?). It was loaded with tomatoes, not advertised, and she has a tomato allergy. This happened before at a now defunct establishment. Not cool. On the way out, a manager greeted our party and asked how our experience was. I explained what I was served, and he indicated that it was indeed not correct. Cassie also shared her story, to which he was equally flummoxed. We were very nice about it and really intended to provide the stories for their own quality purposes. He was very receptive, and wished us well. I think this place has a lot of potential. I am thinking a second visit is merited, for science. No socks with sandals? … They won’t get my business. That’s discrimination. Actually – it’s anti-semetic! I should go there, get kicked out, then sue! I think all of those rules are jokes. Maybe a few bumps due to having just opened the place? I’d be interested to see how your next visit goes. We just walked by that place the other night, and I was thinking we should try it — we went to Jacob & Anthony’s once, and the food there was good, so… *shrug*. We were debating just the other night about the regional elevation in status of your typical “pub fare” – you know, burgers, wraps, deep-fried things and the such. It seems we here in the Capital District take our bar food rather seriously, and that’s not a bad thing given the plethora of choices on offer. I certainly have my own personal favorites, as do many others; in certain instances it comes down to having the right beer on tap to complement the food I’m after. While I argued for the merit of actually reviewing, discussing, dissecting and rating the competing players, the person who does most of the actual cooking in our house said she believed it was unnecessary: one either constructs a competent sandwich, burger, wrap or fries, or one does not; the variations in a successful Reuben are too small to be trifled over, “fries are fries”, and, “You are there to eat, not dine”. She argued that it is meaningless to discuss pub-fare using the same vocabulary as fine dining, as the range/freshness/quality of ingredients, the varying cooking techniques, the amalgamation of complex and diverse flavors, the presentation, the service and the price were simply not on the same plane as lowly pub fare. While I appreciate her point of view, I’m not sure I agree. We all eat for general nourishment, and sometimes the palate yearns for simple comfort food, and at other times it calls for something mysterious, something puzzling, something new. We either walk away satiated, fulfilled and eager to return or we do not regardless of the fare – to me, it makes sense to discuss it either way. It sounds like the “Prep Kitchen” was a fail, and a fairly basic one at that due to simple incompetence on a number of levels. Thoughts? First, I would like to thank you for your thoughtful and engaging response to my post. I’ll tackle your points in the order you presented them (I hope). I don’t know if it’s necessarily true that we take bar food seriously in the Capital Region. I think in this day and age, the accessibility to information encourages everyone to write about their experiences. I think the density of these opinions might be high in this area, and that leads to the perception that everyone takes it seriously. That said, I haven’t been outside of the area much, but when I do go outside of the area, I notice that what we are calling “pub fare” is far superior. The point that your wife is trying to make, that it is meaningless to describe pub fare in the same vocabulary as fine dining is a perfectly valid point. Because the area offers very little pub fare outside of the mediocre, it sometimes becomes pointless to pick nits. Two places may give you the same meat on a burger then add different things to make you remember it more. At the end of the day, you get the same burger. This is why I think the pizza situation in the Capital Region is so mediocre. Places will settle for an inferior ingredient to meet a price point and that leads to inconsistency and mediocrity. That’s not to say there isn’t good pizza in the area, but I digress. 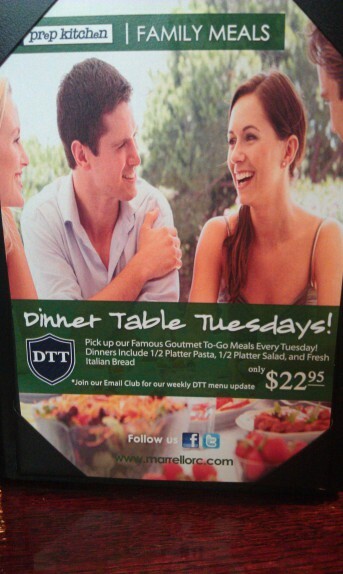 I think your wife is missing a big point that pub fare doesn’t have to be lowly. In fact, just pictures of food from the new Gastropub (posted last week on alloveralbany.com) show that pub food can be great. I just think that the whole idea of making the businesses appeal to a wide audience has expanded menus and caused quality to stagnate. In my specific experience here, I think the point is that I didn’t get what was advertised. I don’t know if I’d consider it a fail based on the one experience. Sloppy, unorganized, yes. Fail, not sure. If you want to see what I consider a fail, check out how inconsistent two visits to dinosaur bbq were for me (1 2). In that case, all that was presented to me was negligence and inconsistency. Here, I’d have to go back and order something different to see how it pans out. Another example of a place that I think doesn’t really even deserve a second visit is Bootleggers in Troy. It honestly didn’t even seem like they tried from the menu to the beers to the execution. My gut feeling is that, since J/A is in the mall, things are going to remain sloppy and unorganized on a repeat visit, since they’re gonna see traffic regardless of what they put out. I’m going to give it some time to come into its own, then go back and see what they have to offer, mainly because the rest of the menu looked interesting. To answer your broad question, I think it is crucial to voice your opinion about something with others. Maybe the person you’re talking to experienced something completely differently, even for something like pub food. This type of discourse helps pick out quality, and further develops your tastes and opinions. Put it this way, if we all stop going to the mediocre places and go to the great places, the mediocre places may have to step up their game to survive. Always value the differing opinions but never concede yours to another’s. Pub fare is a relative term. What we know here in the Capital Region is not what they know in Texas, or California, or Quebec, or anywhere else in the world. Pub fare is unique (excluding chains here, because they are formulaic by target demographic) in that the food reflects the community. We have a very diverse and fairly affluent/well-off demographic here in the Capital Region. The mix of schools (several which draw people internationally) and strong presence of technical and professional businesses make this is an interesting melting pot of cultures and tastes. I will say this: no two foods are created equal. Fries are not fries. Some are hand-cut, some are machined. Some are direct-fried. Some are baked then fried. Some are double-fried. Some are battered/dressed before frying. You get the idea. The same goes for pizza, wings, burgers, fried cheese, spiedies, etc. And I agree that pub fare doesn’t have to be lowly. The same goes for diners. I’ve had more exquisite fare in some pubs and diners than I have in some supposed 4 star restaurants. If you make your way out to the Boston area, check out Lord Hobo. Aside from a fantastic beer list, their “pub fare” is anything but ordinary. I challenge anyone to order food there and honestly think “I could get this anywhere”. I find it absolutely amazing that such conversation could be had over pub food. Definitely entertaining. Slightly unnecessary. But fun to read none the less. R made a good point about beer selection. For me, if a restaurant claiming to have pub food doesn’t have a good beer selection, I’m completely unintersted. And with that, I shall have some good pub food for dinner! Thanks folks – nice followup discussion. And I do agree: the food at the Gastropub looks to be something special, and a rather far cry from the what I consider typical pub-fare (which I think I quasi-defined in my original post) despite the wonderful beer selection (and hot damn, I can walk there on a nice day). Yes, I have had pub fare that exceeds the quality of so-called fine dining establishments, but they are the exception rather than the rule and aren’t, um, indigenous to the Capital Region. I appreciate what the Gastropub is attempting to do for the culture of “eats and suds”, but their aim is high, and perhaps over the head of the typical Graney’s regular who knows not of foie gras (not that there’s anything wrong with Graney’s – I’m merely equivocating clientele and attempting to figure out where their business will come from). I will certainly be a patron in the near future! The question though of how to evaluate, distinguish and meaningfully compare Graney’s and the Gastropub is still (for me) an apples and oranges issue, and one I need to think about a bit more. Thanks for the ramble. That said, I’m off to The Ale House for some nice pub food and a beer. Ah, the simple joys of Troy.